Written by: Eiichi Shimizu, Joe Yamazaki, Stan! The iconic superhero Ultraman, originally appeared in Japanese sci-fi/fantasy films and television, beginning in the 1960s. The character was an alien entity that merged with a human host, creating a superhero that fought aliens trying to invade Earth. Ultraman (stylized as ULTRAMAN) the manga, written and drawn by Eiichi Shimizu and Tomohiro Shimoguchi, is a sequel to the television series, “Ultraman” (1966). The new Ultraman is 17-year-old Shinjiro Hayata. He is the son of Shin Hayata, the man who first merged with Ultraman 20 years earlier. In the shadows, a new threat is growing, and that kind of danger requires a new kind of Ultraman. As Ultraman, Vol. 11 (Chapter 66 to 70) opens, Shinjiro, Dan Moroboshi, Seiji Hokuto, Jack, Taro, and even Shin Hayata (Shinjiro's father and the original Ultraman) come together to battle the forces of the Star of Darkness. It is the ultimate showdown, and Moroboshi must face his long-lost brother Rei... or at least Rei's body. Can he achieve victory? Can any of them achieve victory when they may not really understand the true motives of the Star of Darkness? THE LOWDOWN: The Ultraman manga still reminds me of Marvel Comics' Iron Man, and that is still a good thing. 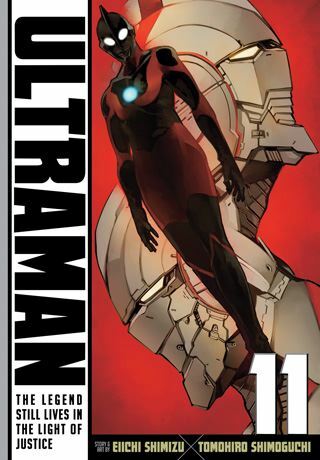 Sometimes, these Ultraman graphic novels are better reads that the current Iron Man comic books. Ultraman Graphic Novel Volume 11 continues to assert this narrative's Japanese science fiction pedigree, with its delightful blend of Kaiju, aliens, other dimensions, conspiracies from another world, and superheroes. This is a delightful electric-pop comics confection, but Vol. 11's payoff is for regular readers of this series. Joe Yamazaki and Stan! 's translation and English-language adaptation make the work of Ultraman manga creators, Eiichi Shimizu and Tomohiro Shimoguchi, a unique superhero comic book worth reading... so that you can be a regular reader and enjoy the pay offs. I READS YOU RECOMMENDS: Fans of Ultraman and readers looking for superheroes from another land will want to try the VIZ Signature title, Ultraman.